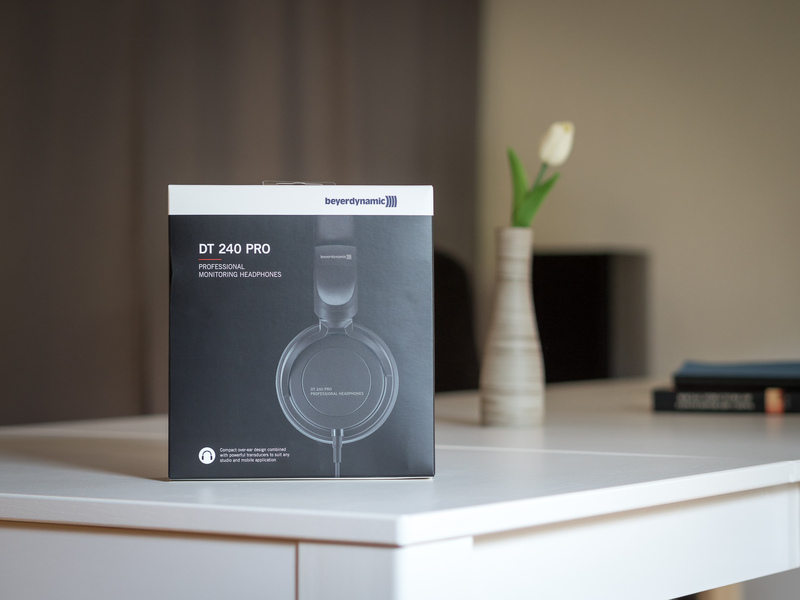 About me: I bought the beyerdynamic DT 240 PRO from Amazon.de out of curiosity only. I have many years of experience with headphones and audio in general. 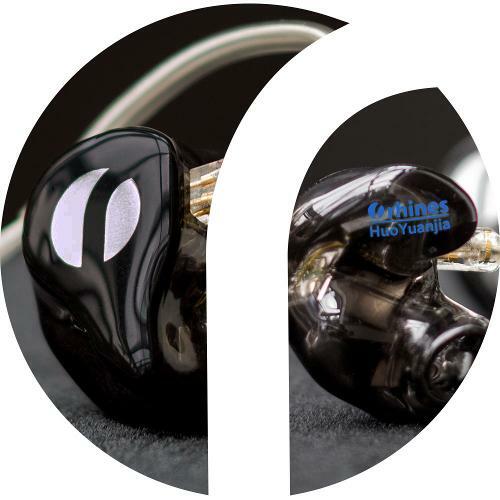 I am a former MOT for a CIEM manufacturer and I also used to write reviews for Headfonics.com. Currently I support my friends' very ambitious German audio blog over at Headflux.de. 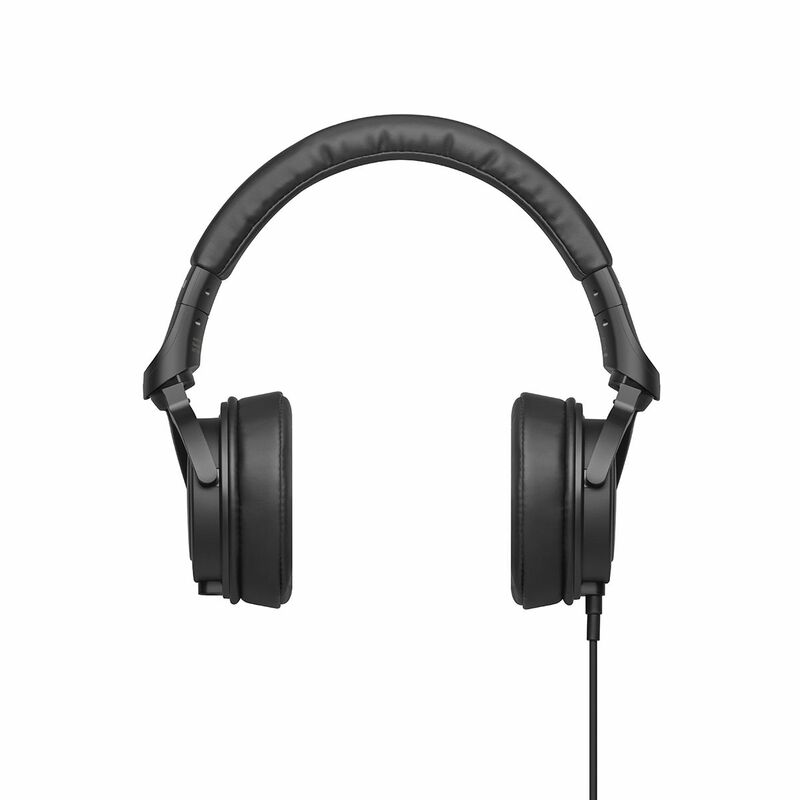 The DT 240 PRO by beyerdynamic (short: BYR) are fairly new closed-back headphones for studio and monitoring purposes. Compared to their larger models like the DT 770, the DT 240 are aimed at mobile use. Thus they work also well as a companion for commuting. The MSRP is 99 € but these cans are actually sold for 85 € and less, including the official BYR online shop. So on paper these should meet the demands of an aspiring audiophile that likes a balanced sound and is looking for a set of affordable portables. Packaging is simplistic and to the point. The design of the outer packaging is recognizably BYR. Sleek. 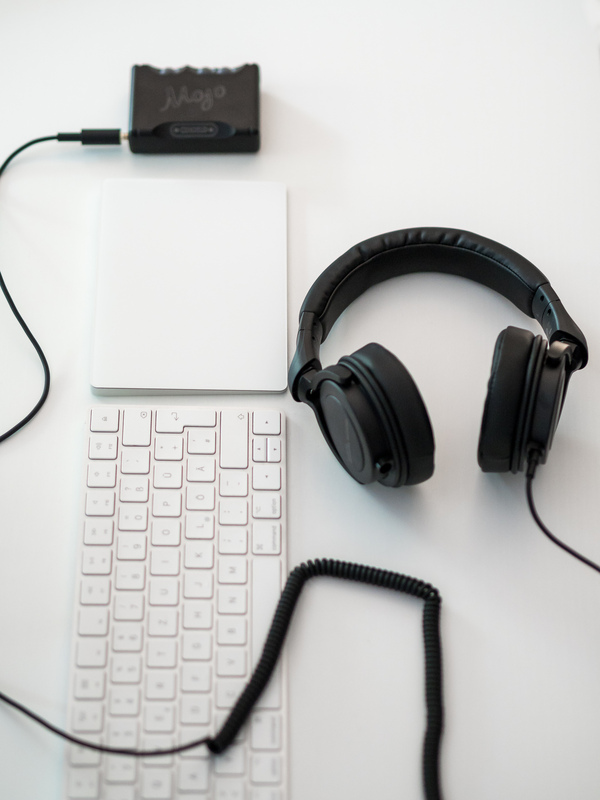 The package is fairly slim as the the headphones' cups swivel 90 degrees and fold flat. 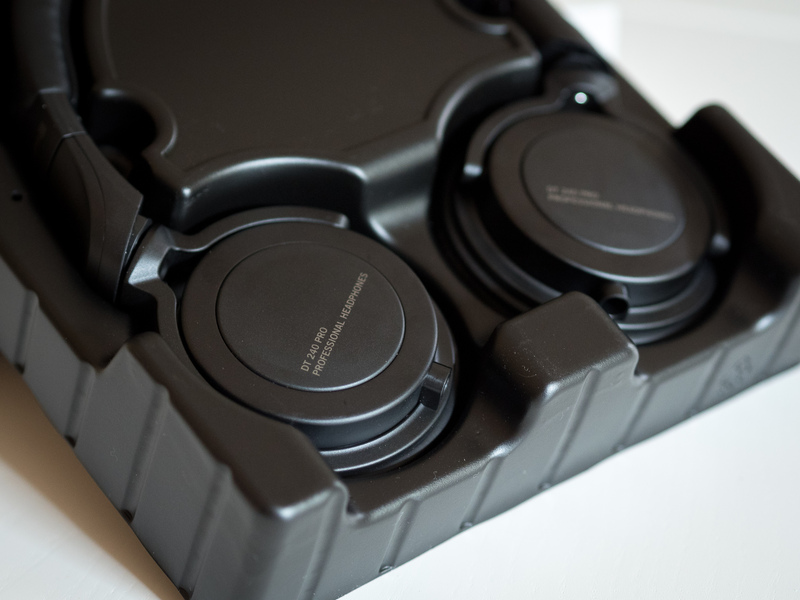 The headphones are held in place by a plastic mold. The removable cable, a pouch and a quarter-inch screw-on adapter are hidden underneath in plastic wrap. 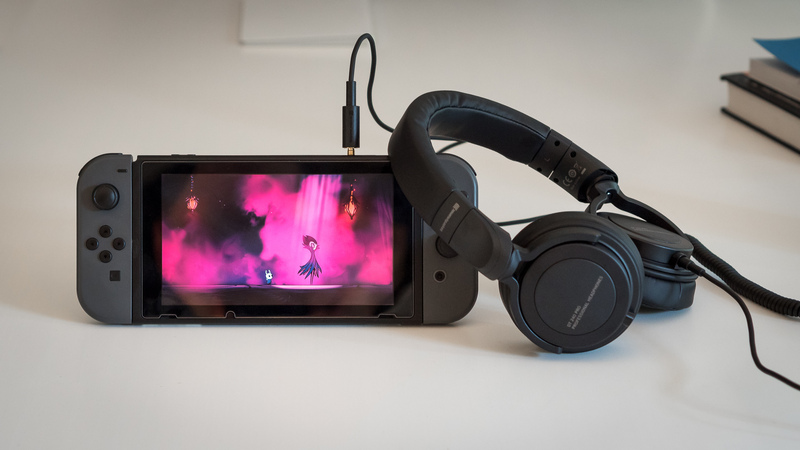 A very low-cost velvet pouch is supposed to protect the headphones from damage, but at the very most all it can do is cover them from dust. The plastic material on the headphones does not scratch easily so the unbranded black pouch is nothing but a useless extra. The coiled cable extends to 3m and pulls itself together to 1.5m. That's a good length for a desktop but some of the cable is always tangling around when I put my source in the pocket. Shorter cables can be had from other sources for cheap. The connection is 2.5mm on the headphones' end and the cable can be plugged in either left or right. BYR opted for a simplistic all-black design. The cups are flat and the headband not too big, so these are no headphones that will make any passerby turn the head. I do find the edge of the headband a bit awkward as protrudes to the sides more than the cups. It looks a bit too... edgy for my taste. This is unmistakably a budget-tier build. The headband has metal enhancements that are only visible when its extended. Everything else is black plastic and synthetic material. While the headband cushion is soft, it feels more like rubber than fake leather. The ear pads use the same material but they have softer dampening. Do note, your ears will not be able to breathe underneath this material! If you are out in the sun, your ears will sweat. Despite beyerdynamic claiming that all their Pro series headphones are made in Germany, the DT 240 Pro is actually made in China. It's all good, though. I didn't notice any manufacturing errors. I do expect the stitches on the cushions to open up after some wear. The DT 240 Pro are incredibly lightweight. That helps with comfort but there is a large issue with the size of the cups. The design is neither over-ear nor on-ear. The best way to wear these is to lay the pads on the earlobes and have them just barely surround the upper pinnae. This solution is nothing you want to endure all-day, but I guess it is a bit more comfortable than a pure on-ear design. Isolation is very good for portable cans. Maybe they're not quite as good as the Oppo PM-3, but they do extremely well considering their weight. I did notice that the headband's edges create some annoying wind noise when using outside. This could have been omitted. Preface: I am a hifi-enthusiast, meaning I prefer neutral and studio-like tunings with no frequency range emphasized whatsoever. That is also my understanding of high-fidelity and I think this should be the aim of high-end and monitoring equipment. If you prefer warm signatures, you have to take that into account when reading my assessment. I will try to throw in some comparisons for good measure. 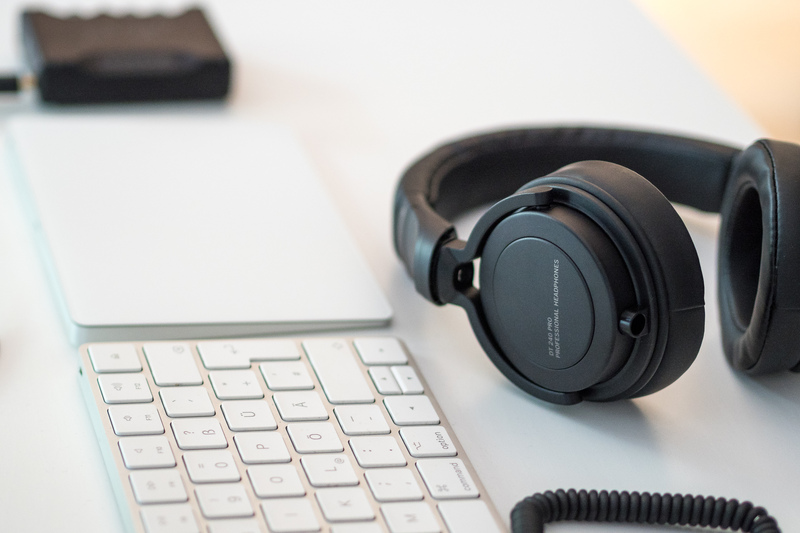 The beyerdynamic DT 240 Pro are warm headphones with a moderate emphasis on the low-end. Mids are adequately open while the treble is fairly soft. I am a big fan of the DT 1350, another monitoring headphone by BYR. In comparison, the 1350s are a lot closer to neutral with overall better balance. 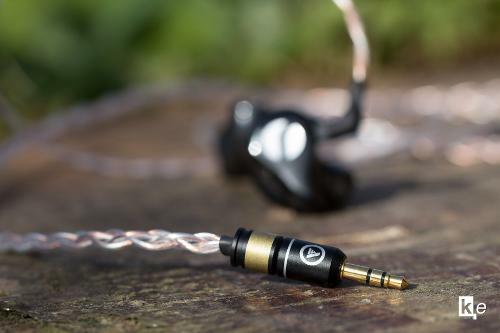 The 240s remind me of the new Aventho (Wireless) consumer fashion on-ears that have a fairly comparable signature. Both, the 240 and Aventho, are warm and a bit soft sounding. From this perspective, the DT 240 Pro are not recommendable as a monitoring headphone - in my humble opinion! 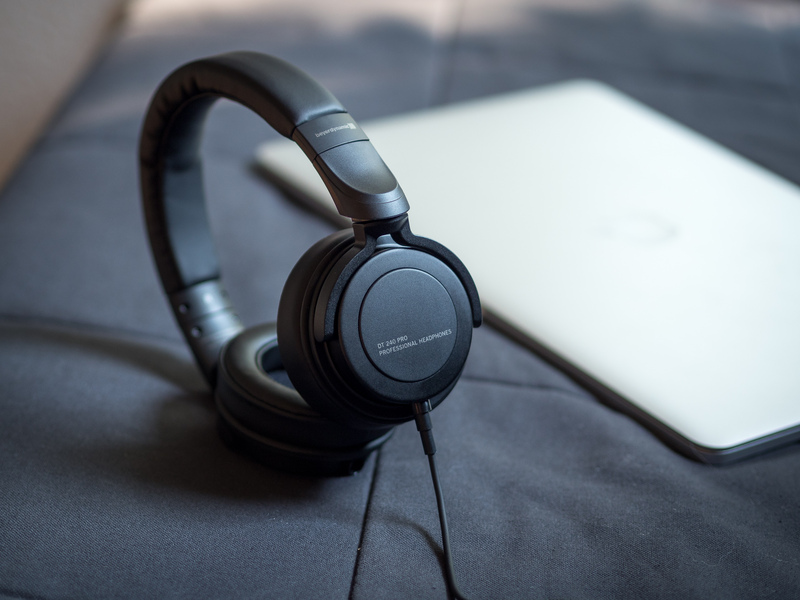 I don't review many budget-tier headphones, so I do have to remind myself of the DT 240 Pro's price tag. Being used to well-equalized magnetostatic headphones and multi-driver IEM designs, the bass comes off as a bit sloppy and muddy. I can't describe the bass' characteristic as textured, but luckily it isn't overdone with punch and oomph either. The low-end boost is actually distributed very consistently all the way down to the lowest octave (~30 Hz). That does help the bass from not sounding too forward like many other headphones that don't have this stellar extension and try to make up for it with a mid-bass hump. I am used to a bit drier presentations, especially from the Oppo PM-3 and the DT 1350. Also the Aventho, though it has comparable bass quantity, sounds snappier and has faster attack. The bass is not overdone to the point that it would be distracting. However, when using the DT 240 for monitoring, I do recommend to use an equalizer or compare with reference speakers to make sure the mastering isn't bass light. For pure musical enjoyment, I found the DT 240 Pro performed quite well as all-rounders and even with Classical musical I wasn't bothered too much by the low-end. I can get very picky about the midrange because I think this is where true high-fidelity matters the most and it's also the frequency range where sloppy tuning shows. Other than Jazz and Classical music fans, there is a widespread toleration for warm and dull mids. I am less tolerant than most Head-Fi'ers. So when I tell you that the midrange of the DT 240 Pro is warm and has a slightly recessed vocal presence, this might be different than your perception. I am basing this claim on using sine swipes. Piano tracks and vocals just sound a bit dark. 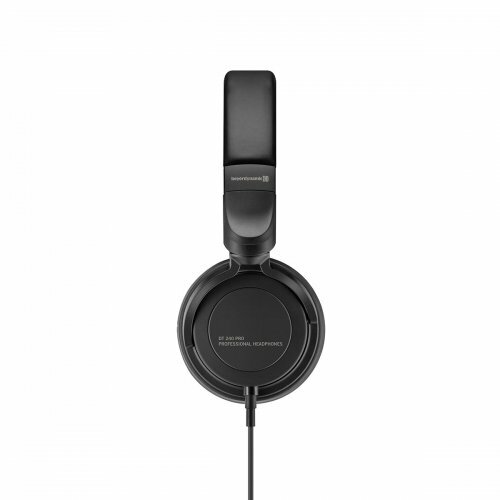 There are but a few headphones that actually exaggerate to the opposite direction - the DT 1990 Pro actually does and also the Musical Fidelity MF200 comes to mind - but there are even less that actually nail the midrange like the PM-3, for example. Again, for monitoring, I think the DT 1350 outclasses the DT 240 Pro by a large margin. Now that I have complained, I do have to say that the mids sound lush and juicy. I admit they sounded better than they should sound and they can be quite addicting. I can get used to the signature and I am fine with the detail resolution, too. There are definitely far worse sounding headphones for triple the price tag. Voices are intimate but not forward, they are homogenous to the bass and most importantly, they sound enjoyable. They are actually a bit too soft and it shows clearly with female vocals. But ultimately an S-sound still sounds like an S and not a TH. There is a prominent dip where the midrange transitions into the lower treble. 5-7 kHz are very recessed and this makes it very difficult to recommend the BYR for monitoring. There is a high risk of shooting your master into an awfully sibilant mess due to this. On the other hand, it makes your audio sound soft and enjoyable even at very high volumes. From 8k and up, the treble performance is actually very solid, if not even surprisingly good regardless the price tag. The extension sounds fine to my ears to 14 kHz at least, which is not a given for a closed-back design. There is no infamous Beyer-peak (excessive 8-10 kHz as found on the DT 770, 880, 990, T1, T70, T90, ...) which is applaudable, however, there is also some energy missing to counterweigh the foregoing dip. Overall, ignoring the technicalities, the treble sounds soft, smooth and recessed. You won't find any sparkle or shimmer here, but also no sibilance. It's almost as if the treble only wanted to support bass and mids. It's a bit too cautious for my taste, especially as a fan of trumpets and violins, but I have heard far worse. The BYR neither stands out for micro nor macro dynamics. It's not an epic sound that emphasized on dynamic recordings, nor does it highlight all the small cues hidden in complex tracks. It's fairly average in both regards. Layering is good, but the imaging is not accurate due to the tonal coloration. 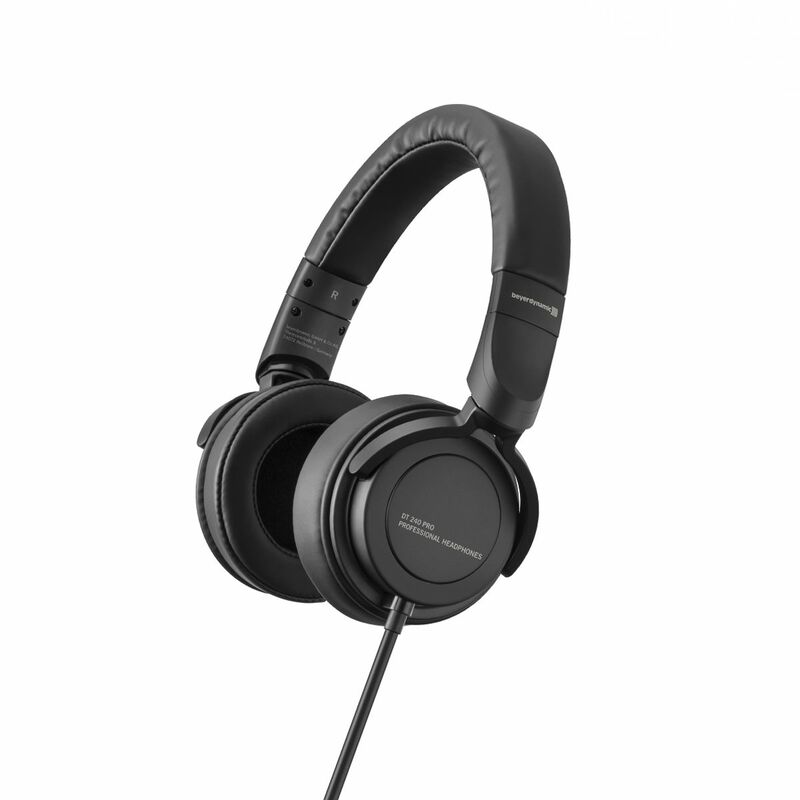 If you compare the DT 240 Pro with other on-ear headphones, the soundstage is good in depth and width. I have used the BYR with a Chord Mojo, Hugo 2 and RME ADI-2 Pro. All of them extreme overkill for this small headphone. I have enjoyed plugging the DT 240 Pro into the Shanling M0 for convenience, but the sound difference to my iPhone is negligible. These work well with any source. I have thrown some comparisons into the text already. However, all of them were far more expensive headphones. The DT 1350 are to date still the only true monitoring on-ear headphones that I am aware of. Every other on-ear sounds colored when put aside. It's not a perfect monitor, but it is fairly close and by now the price has dropped to regions where they can be blindly recommended. The Bose QC 35 (active, because that is the only mode one would ever use them) sounds far sloppier than the DT 240 Pro. Bass-weight is similar but the BYR sound more coherent, which holds true for the highs also. I also have some Marshall Monitor here. They are also something between on- and around-ear by design. The BYR are more comfortable and there is absolutely no competition in regards to sound. The Monitor are a dull and bloated, low-quality bassy headphone that brings nothing but shame to my collection of headphones. Mad Max, ryanjsoo and flinkenick like this. My comment is for your Nintendo Switch, looks like an IPS panel, my Switch has washed out colors in that same game... wonder if I got a scam Switch somehow. heh. ON-topic, I did try these DT 240 Pro's earlier this year on their launch day, was not my cup of tea.